One of my favorite coffee shops in town serves two hot food items: waffles and yogurt bowls. If I had my way, I’d eat both, everyday. The waffles are perfect and they make a homemade jam for topping which they also use on their yogurt bowls. 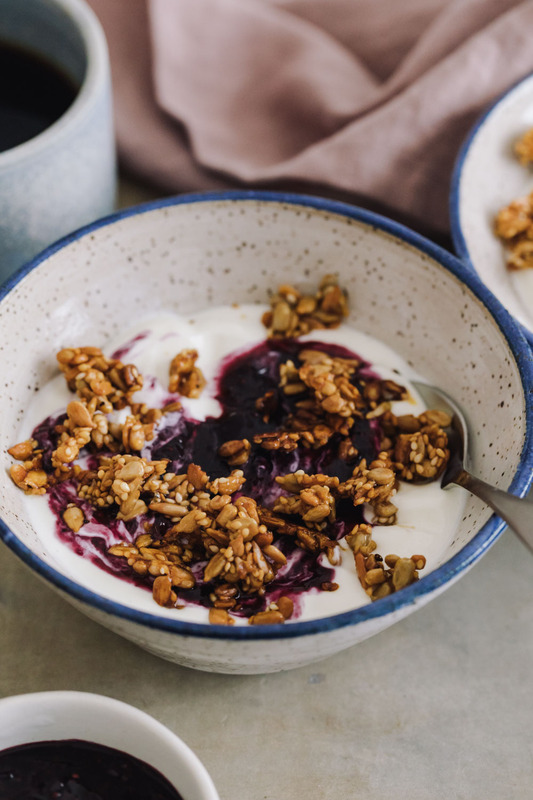 Since it’s not cost-effective for me to eat there every morning, I decided to come up with a quick breakfast that incorporated the same idea of jam + yogurt. I know chia jam is one of those things that might feel silly but it’s kind of amazing. It comes together quick and the chia seeds make for the perfect texture. The blueberry chia jam is also perfect for all that summer fruit you might have on hand (including stone fruit). Add to that my favorite sunflower crunch that is like granola but just seeds: it’s a meal. Fruit: This jam is great with a wide variety of fruit. Summer berries, strawberries, stone fruit, apples, or pears are all great places to start. I kind of use this jam as an ‘anything goes’ type recipe. Seeds: For the seed mixture, you could easily use nuts. I like to keep it with just the seeds (feels a bit lighter). However, if I have almond slivers or nut pieces on hand, I’ll gladly use them. Porridge: Switch the yogurt base for porridge. I love this blueberry chia jam and seed mixture on homemade millet porridge and oatmeal. An easy, filling breakfast featuring two of my favorite components: sunflower crunch and chia jam. A perfect repeat weekday breakfast! In a bowl, combine the sunflower seeds, sesame seeds, honey, olive oil, and salt. Toss until well combined then place on a separate piece of parchment paper. Place the tray in the oven and let the seed mixture crisp for 6 to 8 minutes. The mixture will crisp more as it cools.